Serendipity is one of the great gifts of the internet. One thing leads to another, link by link, and suddenly the evening has gone. I started today at indigenous boats, an interesting blog by maritime author, editor, boatbuilder and sailor Bob Holtzman. He describes the jangada, a traditional fishing boat from the north coast of Brazil. 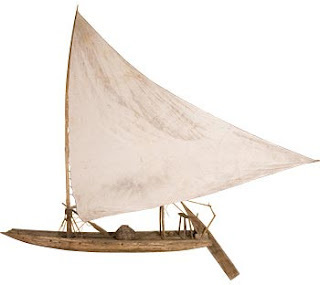 When the Portuguese arrived it was made of five logs of piuva wood (like balsa) held together with wooden pegs, but it has since developed into a planked vessel. It has a highly sophisticated sail with an adjustable mast. There are at least two jangadas in Britain, one in the National Maritime Museum Cornwall (above left) in Falmouth and the other in World of Boats (below right) in Eyemouth, just north of Berwick on Tweed. To find out more on this attractive boat, I googled it (natch) and came up with another discovery, a Brazilian singer with a sweet voice called Cristina Motta. Her song Mucuripe is on YouTube, with some evocative shots of jangadas. It is a bit like Fado, dripping with nostalgia. Chris, Many thanks for your post on indigenousboats blog and for the link, which I'll reciprocate. Fascinating and surprising that there are two of these boats in the UK; what a lovely Brazilian song; and how strange that we both posted about jangadas at the same time!